Five years ago we launched Noun Project with the mission of “creating, sharing and celebrating the world’s visual language.” Today, we’re thrilled to launch a new tool to help people organize, access, and share their own visual assets. It’s called Lingo. 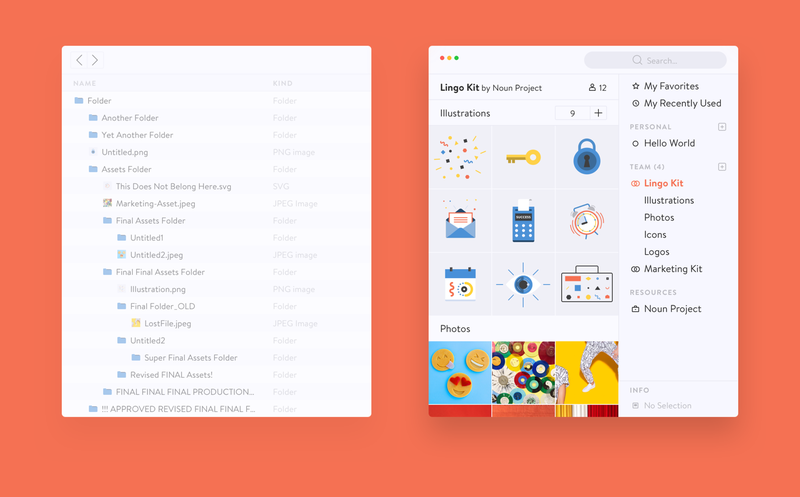 For years designers have organized their visual assets - the icons, photos, illustrations, patterns, colors or what I like to call “the ingredients of design”- in complicated folder structures that are viewed and accessed through messy Finder windows. This folder and Finder paradigm has become so omnipresent in our digital lives it’s hard to imagine another solution, but that’s exactly what we’ve created with Lingo. One of the problems with using the Finder window to peer into your visual language is Finder was not created specifically for visuals. This causes many friction points, such as browsing through long lists of confusing file names, getting lost in deep folder holes, and finally having your visuals mixed in with all your other digital clutter, making them harder to find and use. Amplifying these problems further is the fact that our world has become awash in images — as designers we are drowning in a visual river of content. There needs to be a better solution. Most of the work designers do is visual, so why is it so hard to get to those visuals? Why aren’t visuals front and center? Lingo was built solely for visual content, alleviating many of these pain points. Assets are always signified by, well..a visual. Folder holes are gone and replaced with a simple “Kit and Group” hierarchy system that keeps your visuals always within sight. Add a few tags to your assets to make searching for them even easier. And finally, with Lingo your visuals are in their own unique orderly home made just for them, and separate from all your other digital clutter. Lingo doesn’t just display your visuals in an elegant way, it also makes using them easier. Simply drag & drop or copy & paste any visual asset into Lingo. This can be icons, illustrations, photos, gifs or any of the other building blocks from your favorite content creation tools — yes, that means layers and layer groups directly from Sketch or Illustrator. Once inside, Lingo automatically creates alternate file types of the asset. This not only saves you time by not needing to manually export those asset types, it also greatly simplifies the interface by consolidating the root and derivative assets into a single tile. Now that your visuals are organized you can invite your client or entire team to collaborate with you, we’ve built syncing and sharing functionality directly into the app. And finally, to get an asset out of Lingo, drag & drop or copy & paste it into any app. From getting an asset in, to organizing and sharing it, and to getting it out of Lingo, we’ve designed this cycle to be as frictionless as possible. Thinking ahead, we envision Lingo being the browser for all the world’s visual assets. We’ll start moving toward this goal by allowing designers to publish their own kits of content inside Lingo so other designers can access them, and also integrating 3rd party content librariers starting of course with Noun Project :) Imagine being able to access assets like UI kits, company logos, street signs, photography, and all the world’s flags, all from the same location where your own content is organized. This vision of making all the world’s visual assets just a drag & drop away gets us excited. We believe given the right “ingredients” people can not only create better designs, but more people beyond just designers can express themselves in creative ways, and that is something we all should be excited about. Thanks to Sofya Polyakov and Ben Blumenfeld.